I'm starting off the Festive Fare blogtrain with the traditional Gingerbread Man cookies because it is DinoBoy's favourite cookie. 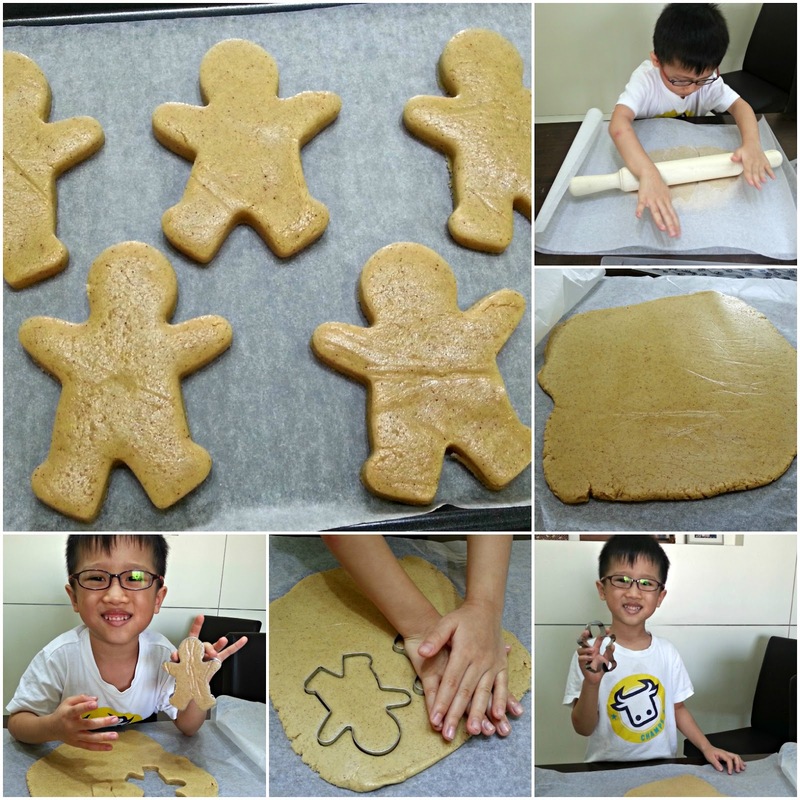 And what's more, DinoBoy will be doing most part of the work; reading of recipe, the measuring, part of the mixing and rolling of the dough plus the most exciting part - cutting out the cookies. For once, I am taking a back seat, snapping photos with my camera, giving some instructions and do part of the mixing and dough rolling follow byputting them into the oven to bake. This is the first time he is doing this thus the worried looked in one of the photo below. We had an enjoyable time amid the mess he created. 1. Preheat oven to 160 degC. 2. Combine all ingredients into a large bowl and knead till smooth. 3. Roll in between 2 baking sheets till approximately 2.5cm thick. 5. 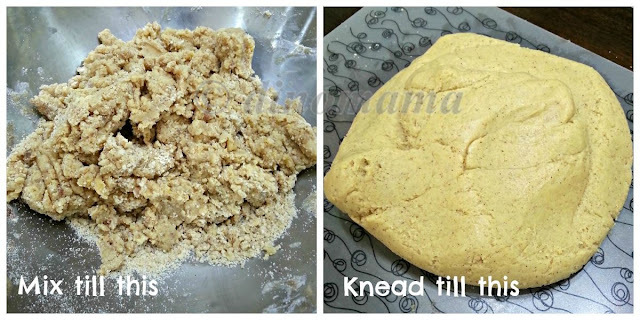 Bring out the chilled dough and use cookie cutters to cut out the shape. 6. 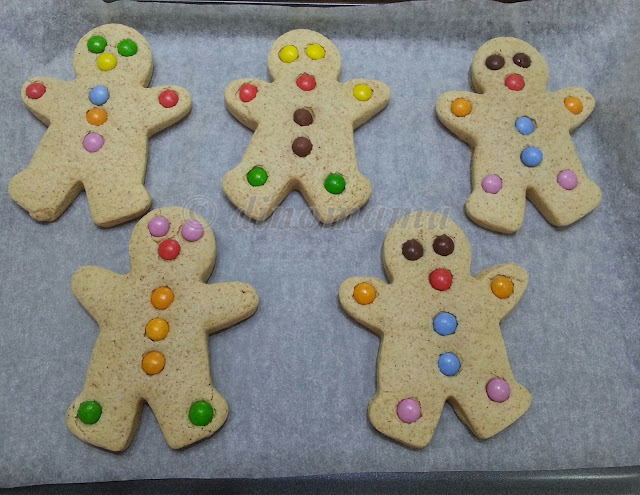 Place the cut out shape on a baking paper lined tray. 7. Bake for about 10mins until slightly golden. 8. 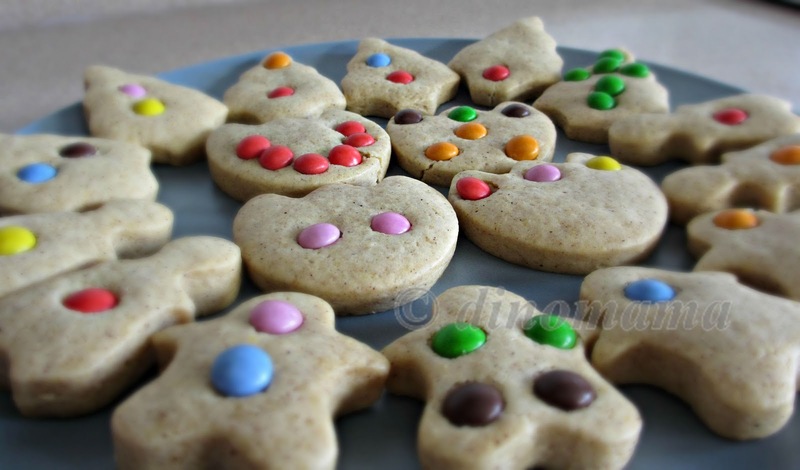 Decorate the cookie with either iciing or candies. 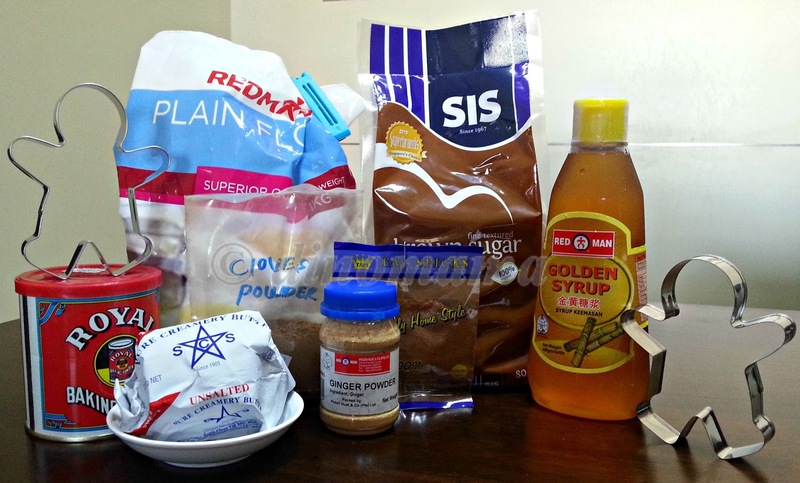 - Please wait till the cookies are cooled down before decorating it with icing, otherwise the icing will melt and run. - If you are decorating your cookies with mini M&M chocolates like us or candies, you have to do it while the cookies are still hot. Remember to push the chocolates into the cookies otherwise they will drop off easily. - My cookies are little bit pale, according to a friend who is an avid baker, she suggests that I bake them longer, perhaps another 5mins to brown the cookies. - If you want to save some time or its too troublesome to look for the ground clove, ginger & cinnamon, I saw in Phoon Huat they have this small bottle of powder with the label "Gingerbread Man", perhaps you can use this instead. We have some left over dough so we made mini Christmas tree, gingerbread man, tulip and angel shaped cookies. Up next we have Serene who will be sharing with us her Christmas Shortbread Fingers that she bakes and gives to family & friends. What a wonderful gift for this Christmas! Serene is a young mum to an active 2 year old toddler. She blogs about a hodge podge of things from marriage, motherhood, parenting, family, friendships and faith to cooking, sewing and baking and everything else in between. But her underlying passion behind it all is her love for sharing her daily discoveries, exchanging stories and ideas and making new friends. You can stop by and say hello at her blog Living Serenely. 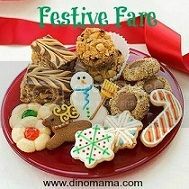 I'm hosting the Festive Fare blogtrain from 10th to 27 December 2012 and together with another 15 mummies we will be sharing our favourite Christmassy food and dessert. if you have any scrumptious food to share with us, quickly grab the badge below and link up with us! I think he likes to have his hands on cooking & baking. Always ask daddy to make breakfast on weekends so that he can help out. Look nice but not nice enough, next time I will bake it longer so its a bit more brown. Nice! I love the smell of freshly baked cookies especially gingerbread cookies as it always reminds me of Christmas! I love the smell too! it fills the house with those warm fuzzy feelings. 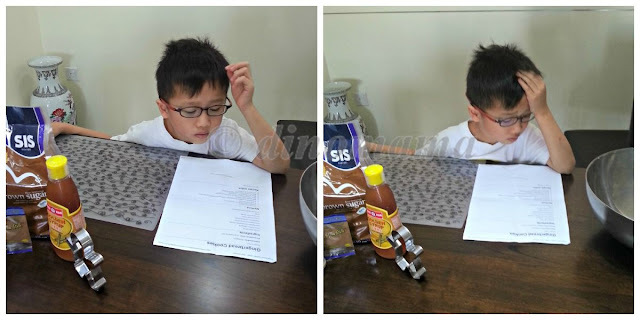 How awesome that you have a little helper in the kitchen! 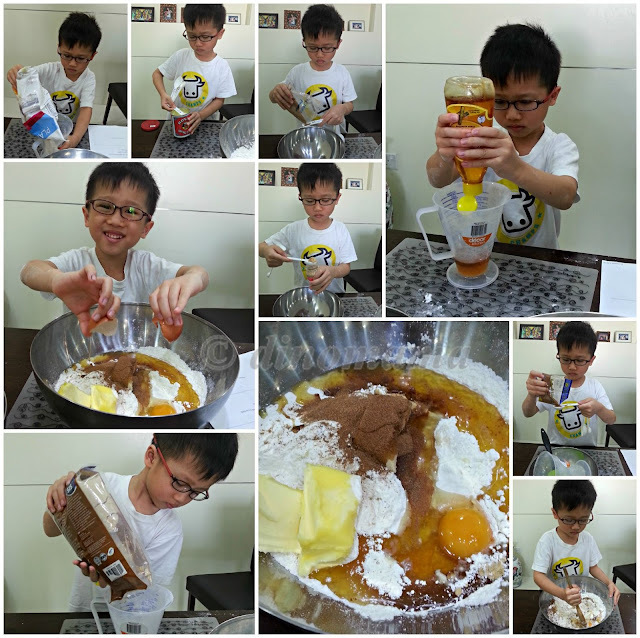 I reckon he did a great job ^_^ Can't wait until my son is old enough to actively help me in the kitchen. I think I just caught a wink with that mention of flour. Flour and a 2-year-old toddler are probably not a good combination. I let him bang around with empty pots and a wooden spoon, and he likes standing up on a stool to watch me cook... someday soon I'm sure.... one day! Haha I love his look of concentration! Real serious right? Big task for him but glad he managed to find some fun while doing it.